I love him, but every day I’m learning. All my life I’ve only been pretending. Without me, his world will go on turning. A world that’s full of happiness that I have never known. Yes Les Miserables is about unrequited love, but seeing the movie opened my eyes to the story in ways my 12 – 16 year old self never understood. I have the soundtrack in my iTunes and I played disc 1 tonight – I heard the lyrics that I heard in the movie that must have been in the play and might not have been on my cassette tape, but somehow I had never heard them fully before. I cried watching this movie. A lot. Jean Valjean is released on parole and has nothing. A priest takes him in and when he steals the priest’s silver, the priest tells the authorities he’d actually given Valjean the silver. He then tells Valjean to take the silver and change his life. 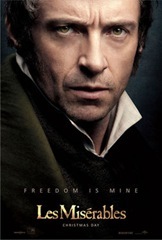 Valjean realizes what a gift he’s been given, turns to God, and decides to become someone else. Therefore he doesn’t turn himself in after his given 30 days and becomes a hunted man by Inspector Javert. Valjean remakes himself and becomes a Mayor who helps his town people. He runs a factory where Fantine works. It is revealed that Fantine has a daughter kept by innkeepers who she is sending money too. The other women in the factory fight with Fantine and although Valjean is there, he turns Fantine over to his foreman to deal with because he sees Javert in the building and finds himself distracted. Fantine is fired. Meanwhile Javert doesn’t recognize Valjean until he sees him lift a cart off of a man and remembers the prisoner who had the same strength. However, he is embarrassed to think that the mayor is that man. Fantine finds herself on the streets selling first a locket and then her hair and her tooth and finally herself to get money for her daughter Cosette. Anne Hathaway performs a stirring “I Dreamed A Dream” and I truly felt her pain. Valjean finds Fantine when she is sick and she accuses him of having let his foreman fire her – Valjean feels horrible and takes her to the hospital. At the same time, Valjean finds out that Javert has arrested another man who he thinks is Valjean and Valjean realizes he cannot let that man take his punishment for him. So not only does he saved the man who fell under the cart, he also saves this innocent man about to become a prisoner by turning himself in, AND he promises Fantine he will rescue Cosette for her. I realized he truly turned his life around – paying forward the good the priest did for him as well as doing so many acts of kindness for the poor people who live in his town. 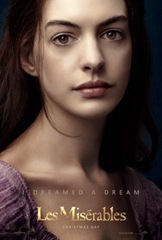 Fantine dies, and again Anne Hathaway’s performance of “Come To Me”,” along with Hugh Jackman’s acting, made me cry. Valjean has turned himself in, but he begs Javert for another day of freedom so that he can rescue Cosette. Of course, when he finds Cosette he realizes he is going to need more than just one day. 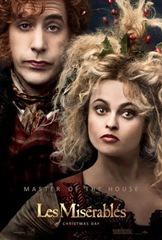 The poor girl has been neglected and forced to work by the innkeepers – the Thenardiers – hilariously played by Sasha Baron Cohen and Helena Bonham Carter. And Javert would never grant Valjean his freedom – so Valjean becomes hunted again. He finds shelter with the very man who he rescued from the fallen cart – again, an act of kindness paid forward. He now has Cosette with him – Isabelle Allen played young Cosette and was so cute showing how she did not want to stay with the Thenardiers – and also made me cry when she asked Valjean to be her father. Russell Crowe has been criticized in his role as Javert, but in his song “Stars” he portrays the tenacity of Javert as he swears he will never give up his search for Valjean. Nine years later, Valjean and Cosette are on the streets giving money to poor people. They are spotted by the Thenardiers – as a kid I never realized the Thenardiers played such a large role in the 2nd half of the play. Eponine remembers Cosette because as the daughter of the Thenardiers, they were children together. 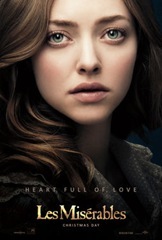 Marius also spots Cosette at this time and the two fall in love at first sight. Because Eponine is good friends with Marius, she agrees to bring him to Cosette, even though she is in fact in love with Marius herself. Eponine is another character who does acts of kindness for the one that she loves. When her father follows her to Cosette’s house intending to rob it, she screams in warning to Valjean and Cosette inside. She then sings “On My Own,” as she realizes she will not be with Marius. While all of this is going on, Marius is in the midst of a student rebellion against the French army. While initially distracted by falling in love with Cosette, Marius joins his friends for their attack. “Do You Hear the People Sing” is performed as a rousing anthem, encouraging the people to join the rebellion. Marius sends Gavroche, a young boy (also a favorite character of mine from the play) to deliver a note to Cosette. The note is intercepted by Valjean, who rushes to the barricades to rescue Marius. Gavroche exposes Javert, who was posing as a spy, and he is captured by the rebels. Eponine joins the fighting as well and is shot, dying in Marius’s arms, where she always wanted to be. Another tear jerking song, “A Little Fall of Rain,” is performed by Samantha Barks and Eddie Redmayne. Valjean arrives at the barricades and saves the students from a sniping attack. Therefore he is given permission to deal with the captured Javert. Instead of executing him, he frees him. The rebellion is ended when all of the students are shot and killed, including young Gavroche, but excluding Marius, who is dragged into the sewers by Valjean. Valjean’s song “Bring Him Home” is again a tearjerker, and for the first time I realized that the song is actually a prayer by Valjean, asking God to save Marius. As Valjean drags Marius through the sewers, Thenardier again makes an appearance, stealing Marius’s ring. When they exit the sewers, Valjean again encounters Javert who is still not willing to give up his chase. Javert ends up killing himself when he cannot come to terms with Valjean having spared his life but not wanting to let him go free. Marius wakes up to find himself with Cosette. He laments the loss of all of his friends, but Cosette promises him they will be together forever. Valjean shares his past with Marius, making him promise to never tell Cosette, and he departs. While I always loved those words, somehow I never understood their meaning. That Valjean had lived a full life, taking care of Cosette and loving her like his own. That in fact all the characters had loved and given and were kind to each other. 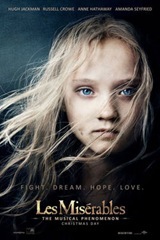 So while Les Miserables is a love story, it is also a story of redemption, acts of kindness, and love of God. I loved the movie. I don’t think it is comparable to the stage production in terms of the actors’ singing, but I think all the actors did their roles proud and brought the story to life. I would love to see the stage production again now that I understand the story completely!